Last edited by bigjohnsd; 28-Mar-2019 at 08:56 AM (580). Yes you can install JBL or any aftermarket speakers with it......the packtalks have the normal audio jack! Cardo is accepting pre-orders for the JBL Speakers now through their website, link above in 1st post. 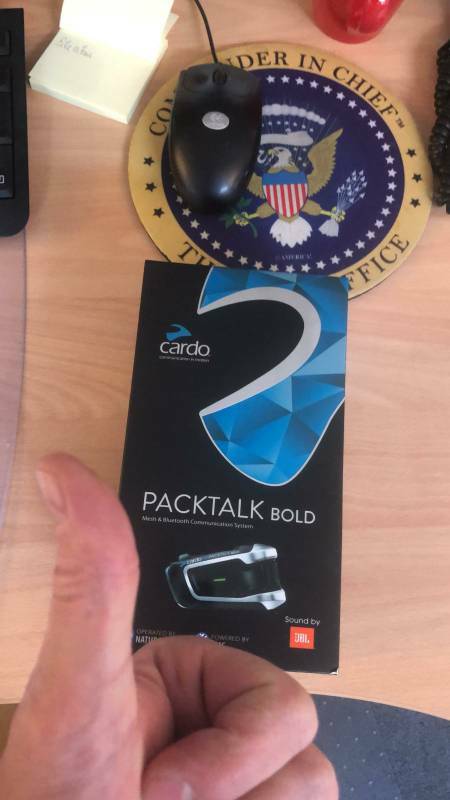 So if you order a Cardo Packtalk today will it come with JBL speakers? I'm not certain of the answer. Send them a message on the support page. Anyone that is interested in the new 45mm Cardo JBL speaker prepare to be blown away. Remember the Maxell adds with the guy in the chair being blown away by the audio. more importantly look at the thickness of the 45mm. These speakers are the about limit of what can fit in the Schuberth C3 Pro without touching my ears. They give you a Bar Code to scan with the Cardo App it unlocks a Audio Profile for JBL. The sound is very full I listened to Guns & Roses, Ramstein, Russel Watson, Andrea Bocelli and finished with Jimmy Buffet. If you like your audio loud with alot of punch you will really like the new 45mm JBL. The Vocals sounded smooth and full no tiny sounds. Only issue I have with all this personally I think it's a hazard and to distracting. But it is a really nice product and smashes the Sena into ground the two can't be compared. If anyone wonders I don't work for any of these companies I'm just testing them out. Last edited by flyjets; Today at 01:31 PM (771).